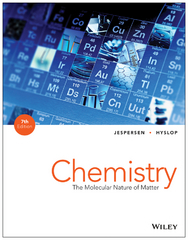 Chemistry: The Molecular Nature of Matter 7 Edition Jespersen’s Chemistry 7th Edition provides readers with the necessary practice, support, instruction and assessment that is required for learning and teaching the content of a General Chemistry course. This text provides the forum for problem solving and concept mastery of chemical phenomena that leads to proficiency and success. The Seventh Edition includes revisions to key content coverage areas and concepts and the addition of more Analyzing & Solving Multi-Concept problems and examples throughout the text. An increased emphasis has also been placed on the intimate relationship that exists between structure at the submicroscopic molecular level and the observable macroscopic properties of matter. Jespersen provides readers with a clear, concise and easy to understand General Chemistry resource.